With classic styling and clean lines, the Portobello Position Chair will enhance the beauty of any outdoor or indoor living space. When combined with one of the Milano Tables, a set of Portobello Folding Chairs makes a comfortable and beautiful outdoor dining area perfect for warm weather gatherings. 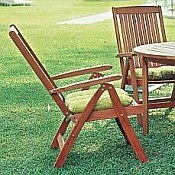 Sturdy, comfortable and adjustable, you will want to dine outside all the time with this beautiful wood patio furniture. 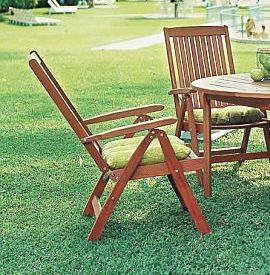 Portobello Patio Chairs are constructed from durable Eucalyptus wood and stainless steel hardware. Eucalyptus wood is easy to maintain and is naturally resistant to rot and insect infestation. Additionally, each piece is finished with Polisten, a Brazilian product that provides even more protection against the damages of moisture and insects, extending the life of the furniture. Dimensions: 41" x 23" x 23"